I’m redefining “hot flash.” Instead of a sweaty, feverish, hormonal attack that drives an otherwise normal woman to strip off all her clothes and fan herself with whatever is closest with a crazed look in her eyes, it’s just going to be News Flash with style… Eff You Hormones. $5 Flip flops from Old Navy (bought 4 different patterns, at $5 a pop I shoulda got more) I highly recommend shopping for flip flops, they don’t give you muffin top even if you just started your crash diet. The only shoes I'll be wearing until September. Mouthy beach towels from Target, there are more in the store than online with super sassy sayings. This towel should not accidentally go home with someone else’s kid. And my all time favorite sunscreen is on sale at Walgreens. It goes on light and is the only sunscreen that has successfully saved me and mine from sunburns while we’re on the boat or the pool deck all day long. It even feels good on your face, without the sticky-oily-smelly feel that other sunscreens have. 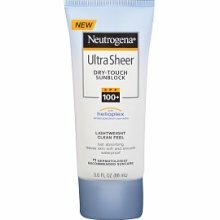 It’s Neutrogena and I buy the spray, the lotion and the stick in great quantities whenever I find it on sale. And my summer cocktail is going to be a Shandy (light beer mixed with light lemonade). It’s refreshing, delicious and practically a diet food. Welcome back, Summertime, let’s party. This entry was posted on 06/13/11 and is filed under random goodies.